The ONLY direct bus service to Central Chamonix, with a journey time of just 75 minutes from only €16.99 one-way when you book in advance. Operating every day (Except 25th December) . 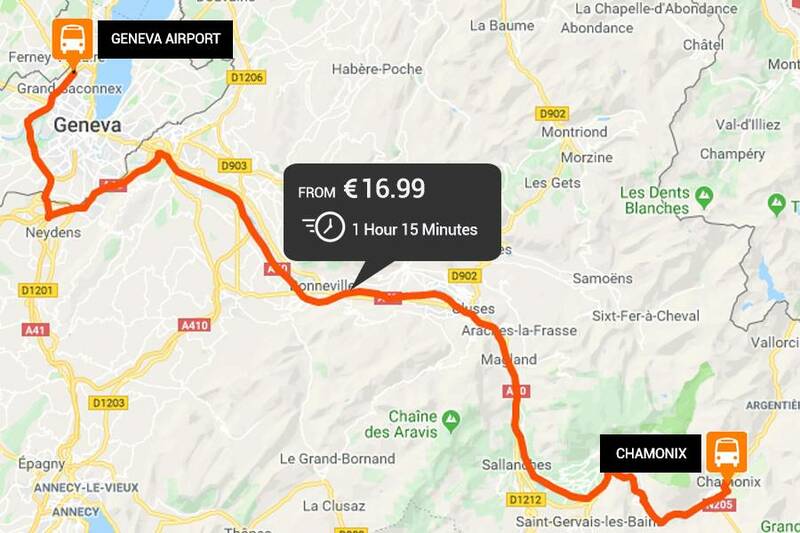 With easyBus, the journey from Geneva to Chamonix is direct; with just 1 hour 15 minutes between you and the center of one of Europe’s most popular alpine destinations. The service runs every 75 minutes, ensuring that you’re never kept waiting too long. At Chamonix, the bus departs from Chamonix Bus Station, Avenue de Courmayeur. Please wait by the easyBus sign at the easyBus bus stop. The bus station is a very accessible start, end or intermediate point for any onward journey throughout the Chamonix Valley and even into Italy. With local and Italian bus connections, the free Chamonix Mulet shuttle bus around town, and the frequent Chamonix Valley train service which easily connects you with Servoz, Les Houches, Tacconaz, Les Bossons, Le Praz, Argentiere, and Vallorcine.